Do you love the thrill of the crash? Do you love the chance to save lives each shift? Then it is time to cross over to the dark side! Canberra Veterinary Emergency Service is looking for Full Time, Part Time or Casual Experienced Veterinary Nurses to join our experienced team. Previous experience in emergency and critical care is an advantage but your attitude and professionalism is of paramount importance to us. If you do not have experience in emergency and critical care, internal and external continuing education and training will be provided as well as emotional support from a compassionate and experienced team of emergency vets and nurses. You must be able to multitask, work independently and prioritise workflow without becoming stressed. Any shift can contain a combination of triage, outpatient care, surgery, monitoring and care of hospital and critical care cases. Are you looking for a clinic that aims for great work-life balance? We are looking for an experienced, qualified and highly motivated veterinary nurse to join our team. You will be working with an a dynamic and friendly team of 5 full time vets and nurses that believe in compassionate client and patient care. Northside Veterinary Centre is a locally owned, brand new purpose built clinic, in the centre of Canberra, 5 min walk from Canberra's best coffee, a range of restaurants and easy access to public transport. Our facilities include two surgeries, a dental suite and ultrasonography, separate dog and cat areas, digital and dental radiography, heated recovery cages, oxygen support cages and heating inspired air units for anaesthesia warming. We advocate and aim for fear-free veterinary care and the primary role of this position is to provide a high level of care to both medical and surgical patients as well as excellent customer service. We have a varied case load with a high percentage of referral work. The position is for 38 hours a week to fall within 8am - 7pm Monday - Friday and 8.00am - 5pm Saturdays. The clinic is not open on Sundays and public holidays. We are looking for a friendly pet owner who has completed or is enrolled in Certificate IV Veterinary Nursing to join our happy team in Amaroo, ACT as a permanent part time (potentially full time) veterinary nurse. Our vets and nurses offer our clients and their small friends an excellent level of care and our hospital is part of the local neighbourhood. We love our jobs, we love our patients and our clients know that they are part of the Small Friends “family”. Package includes superannuation, paid annual leave, personal leave etc. 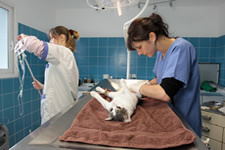 Why work at Small Friends Veterinary Hospital? Clean work place…it doesn’t smell! Well it doesn’t smell yuck, but it can often smell of baked goodies, hot chocolates or staff lunches!!! Completion of, or current enrolment in, Certificate IV Veterinary Nursing. Interested? Please email an application letter with your curriculum vitae to Small Friends Veterinary Hospital's practice manager, Annette Robertson Almond. Greencross Vets, a pioneer in the Veterinary landscape for over 10 years, are committed to raising the industry bar and we want you to be a part of our journey! Due to expansion, we have positions available at Tuggeranong in the ACT. Flexible working hours and varying levels of experience considered. Greencross Vets, a pioneer in the Veterinary landscape for over 10 years, are committed to raising the industry bar and we want you to be a part of our journey! Due to expansion, we have positions available at Phillip in the ACT. Flexible working hours and varying levels of experience considered. Inner South Veterinary Centre is looking for an amazing casual veterinary nurse to join our team! Canberra is a fantastic place to live for those interested in physical activity, eating out, the arts, culture and the outdoors! Canberra has the best mountain biking in Australia. Inner South Veterinary Centre is a busy 7-Vet hospital in Narrabundah, ACT with 6 amazing nurses and a fantastic team of receptionists. We are passionate about providing high standards of veterinary care. We come to work to do what we enjoy doing - helping improve the lives and wellbeing of animals and in turn doing the same for their owners. Our veterinarians, nurses and receptionists, all work together so that our clients furry, feathered or scaled family member gets the care and attention they deserve. We have all types of fancy gadgets such as Ultrasound machine, Digital X-ray machine, Dental X-ray machine, In-house blood machines. We are looking for an experienced casual veterinary nurse to join our nursing team. Apply clinical nursing skills including routine anaesthetic and post-op recovery monitoring, blood draw and IV catheter placements. A high level of patient care standards and attention to detail. Ability to communicate well with fellow nursing staff, veterinary professionals and associated hospital team members. Be professional and punctual in the workplace. Certificate IV in Veterinary Nursing (or equivalent) and a minimum of 2 years' clinical experience. Ability to work well and multitask in a busy hospital environment. A keen desire to deliver excellent standards of patient care and customer service at all times. A genuine love for animals and their people.